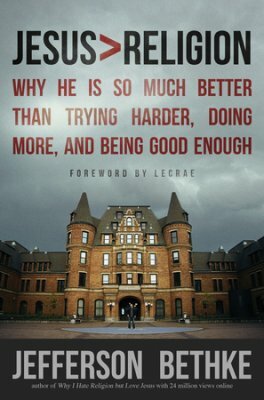 Jefferson Bethke, Jesus > Religion: Why He Is So Much Better Than Trying Harder, Doing More, and Being Good Enough (Thomas Nelson, 2013), 240 pages, ISBN 9781400205394. Jefferson Bethke has a brilliant way with words. This is no surprise to anybody who discovered him through his “Why I Hate Religion, But Love Jesus” video which went viral in early 2012. He knows how to connect with our culture and the millennial generation. When I started reading Jesus > Religion: Why He Is So Much Better Than Trying Harder, Doing More, and Being Good Enough, it was a breath of fresh air and I could seldom put down my Kindle so long as this book was on it. He engaged me. He spoke to me like we were having a coffee and I felt like I could see him winking from time to time to make sure I knew not to take him too seriously, which ironically was why I felt a poignancy and power to his insights. This book is chock full of Tweetable quotes and and citations you can make Instagram photos with. All of these are what make Bethke the person you could allow into your home to have a conversation about spiritual matters even if you would never darken the doorstep of a church. It really is no surprise his message and this book have been so warmly received. This is a book you can — and should — give to that friend or family member who is done with church or never was affiliated in any way with institutionalized religion to begin with. Bethke’s got a voice and a tone that is disarming. The book begins with Bethke mentioning he has no formal seminary training. This didn’t bother me but it may annoy some due to the nature of the book and the large platform he has attracted since his viral video came on the scene a few years ago. I immediately thought of people to recommend this book to. People who would certainly have felt they’ve been in the author’s shoes. Bethke lets the reader in behind the curtains of his own upbringing with his parents’ divorce, to his mother’s sexual orientation and to his party lifestyle and drug abuse before dedicating his life to Christ during University. The transparency in the book almost reads like an autobiography, weaving his personal life into and out of his thoughts and this helps you realize you’re reading a person’s journey and not just reading a theological manifesto. None of the content is wordy or academic, even though Bethke clearly likes to read and has no shortage of references to his favorite authors. Being well-read doesn’t turn this book into something overly academic. This book will not overwhelm the average reader. If there was something I’d find fault with, it’s merely how young he is in expertly proclaiming some of his views. He stated that he was only 23 at the time of writing this book and sometimes his insights in to life and how the world works betray his age and worldview. But that’s also precisely why young people will not have a hard time relating to this book and benefitting from its content. Those not of the millennial generation may yawn at some of his insights and realize he’s not stating anything really new here, but he has new and brilliant ways of communicating it in a way that works. The book covers basic foundational Christian principles. Bethke is upfront with the fact that he’s not a theologian, and admits to being largely “unqualified” to write this book from the get go. While I think that is the beauty of this book, some might fault the book for that reason. Over all, the good far outweighs the little bad there is to found here, and there’s very little to find fault with in a book that can be read by non-Christians, recent converts or old timers alike. If this is the kind of book he can write in his early twenties, then just wait and see what he provides the Body of Christ in the years to come. I believe his writing will only continue to improve as Jefferson Bethke is truly a man wise beyond his years.